Style, price, and functionality should be your top priorities while shopping for a dinette set, dining room table, or kitchen table. American Freight Furniture and Mattress has a unique selection of formal and casual dining sets at a variety of different price points. We even offer standard height and counter height tables to help you create the right ambiance for your home. Today on the blog, we’re sharing our love for the Derby 5 Piece Dinette Set. This stylish square dining set is exactly what you need for your dining room or kitchen. Keep reading to learn more about the casual dining table and chairs. 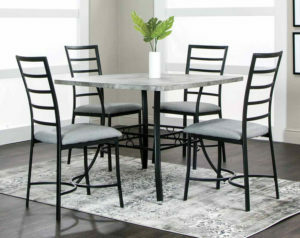 The Derby 5 Piece Dinette Set is perfect for your home. The square marbled tabletop features swirls of white, light gray, and dark gray hues. The base of the table is black metal and features a narrow square frame. Each of the four dining chairs has a ladder back of the same black metal. The four legs and framework of the chair are also black metal. The chair seats feature a plush gray fabric cushion. The dimensions of the table are 40″ Length x 40″ Width x 30″ Height. 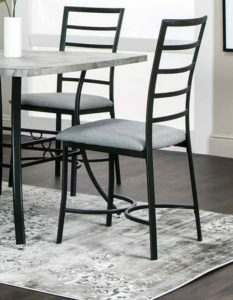 If you’re searching for discount dining room furniture that doesn’t compromise quality or style, you need to check out the Derby 5 Piece Dinette Set. The compact design won’t overcrowd your eating area. The metal framework of the set is durable and built to last. Plus, the complete set is under $300! We love to pair the Derby with a variety of kitchen and dining room layouts. If you have a spacious eat-in kitchen, consider staging the Derby dining set out in the open. In smaller kitchens for couples, tuck the table against one wall or in the corner to give you plenty of room for eating and maneuvering your kitchen. In open concept kitchens, use the gray and black dinette set to bridge the gap between the kitchen and living room. Not only is the Derby versatile, modern, and affordable, you can take it home today for $50. American Freight Furniture and Mattress offers a payment plan option. We also offer free layaway and same-day delivery for all in-stock items. How will you make the Derby 5 Piece Dinette Set your own? We suggest using simple decorations to make this adorable kitchen table pop. Start with the placemats. For a subtle look, choose a solid color like white, light gray, or black to blend beautifully with the marble and contrasting frame. You can also add color and texture to the table with bright placemats. We recommend choosing a cheery color like yellow or bright green to make the kitchen inviting. For a cozy appeal, try a deep red or cranberry shade. You can also set the table with patterned cloth napkins instead of placemats. Mix and match with different colors and styles to find napkins that reflect your style and match the table design. Last but not least, don’t forget the centerpiece! Choose a functional item like a napkin holder or matching salt and pepper shakers. If you’re leaning toward a more decorative piece, a shallow vase filled with faux or fresh flowers is a great choice. American Freight Furniture and Mattress also sells a coffee table set that matches the Derby 5 Piece Dinette Set perfectly. The Derby 3 Piece Table Set comes with two matching side tables and a coffee table. Check out your local store to see the dinette set and coffee table set in person. Can’t find your nearest American Freight? Click here to view our store search page. For more information about how to purchase the right kitchen table for your needs, click here. 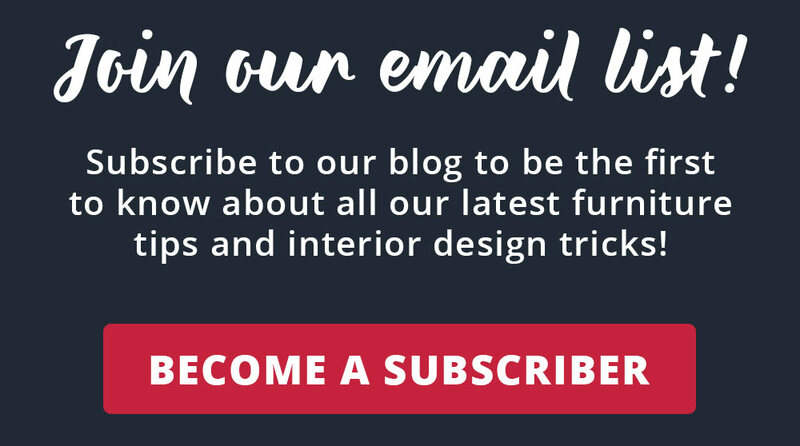 Are You a Blog Subscriber? 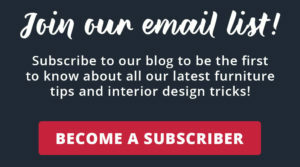 It takes less than a minute to become a blog subscriber to The Official Blog of American Freight Furniture and Mattress. Click here or the image below to join our mailing list. We’ll send you the latest scoop on recent blogs directly to your inbox!